This powerful “digital story” about falls through skylights from the California Fatality Assessment and Control Evaluation (FACE) would be an excellent training video for construction workers, builders, and anyone who works on roofs. The video was produced by the California Fatality Assessment and Control Evaluation (FACE) program in the Occupational Health Branch of the California Department of Public Health. When Cassandra warned the Trojans about a peculiar looking horse, she was ignored. In a somewhat similar vein, the Insider has predicted potentially dire consequences of an aging workforce: unable to retire, some older workers labor to the breaking point and then might hope to parlay workers comp into the retirement plan of last resort. So far it has not turned out that way. But a new study by Sage Journals confirms some of our concerns about risks among older workers and possibly even explains why fatally injured older workers might not show up on comp radar. The Sage researchers set out to examine the relationship between fatal falls and age. They focused on the construction industry, which comprises only 8 percent of the American workforce, but generates 50 percent of all fatal falls. The frequency of falls among younger workers (here defined as under 55) was higher, but older workers who fell were more likely to die. (Kudos to Sage for defining older workers as 55+ – as opposed to the fairly meaningless federal standard of 40+.) The greatest risks for fatal falls occurred, not surprisingly, among roofers, iron workers and power line installers. Among roofers, older workers had a fall rate of 60.5 fatalities per 100,000 workers, compared to 23.2 fatalities among younger workers. Older workers were more likely to fall from ladders. In addition, their fatal falls could occur at substantially lower heights than the fatal falls of younger workers. 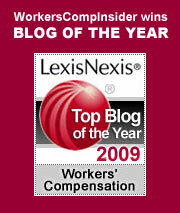 As we continue to zero in on the problem, the workers comp dimension comes into focus. Fatal falls among older workers were more likely to occur in residential settings – worksites less likely to be overseen by OSHA or state authorities. And fatal falls were more likely to occur among small contractors, many of whom were sole proprietors. The study points out that nearly 40 percent of construction workers 55+ are self employed. Therein may lie one of the clues to the mystery as to why workers comp costs among older workers have not risen at the rate we once anticipated. Among fatalities, a substantial portion of the workers were independent contractors and thus did not carry workers comp coverage; many states preclude coverage for sole proprietors. Even in states where independent contractors are allowed to enroll in comp, most did not bother, as the cost, often based upon the state’s average industrial wage, is well beyond the means of a part-time, self-employed craftsman. Case in point: In Massachusetts, a relatively low cost state for comp, the rate for roofers is $26.10 per $100 of payroll; the state average industrial wage is $42,700. A sole proprietor roofer would have to pay over $11,000 to secure the protection of a comp policy, even if his annual billings were less than the average industrial wage. The Sage study points to a number of factors in the severity of falls among older workers. Over time, we all succumb to the biomechanics of aging: slower reaction times, decreased joint mobility, reduced elasticity of tissues and loss of strength. Based upon my own experience, mix in a little forgetfulness, an occasional lack of coordination, and you have a potentially toxic mix, especially in the context of heights and ladders. The aging workforce is not about to go away. The Sage researchers point out that older workers – again, 55+ – totalled 17 million in 1998, reached 27.9 million in 2008 and are projected to reach 40 million by 2018. The median age in construction has gone from 34 in 1985 to 41+ in 2009; in the same period, workers 45 to 64 went from 25 percent to 34 percent of the workforce. Given the absence of strong safety oversight in residential construction, the inevitable aging of the workers who perform residential work and the common use of ladders, we can expect the trend of fatalities among older construction workers to continue. The impact on workers comp is another matter altogether. It appears that many of the aging craftsmen working on our homes are independent contractors. When they fall, there is little or no safety net between them and the cold, hard ground. Thanks to Julie Ferguson for the heads up on this research. Geoffrey Hampton worked as a laborer for Intech Contracting LLC. Hampton, an insulin dependent diabetic, was working with a crew on September 9, 2009, repairing a bridge in Muhlenberg KY. Hampton suddenly uttered a profanity and walked to the edge of the bridge. He climbed over a 4 foot barrier and fell 60 feet, suffering permanent injuries. Hampton has no memory of the incident. His co-workers testified that he had been complaining about not feeling well; that he had taken a snack of sweets to adjust his blood sugar; and that the fall did not appear to be an act of suicide. Hampton was certainly “in the course and scope” of employment, but the question for the courts was whether his injuries arose “out of” employment. The Appeals Court found that his idiopathic condition – diabetes – was the likely cause of his actions and that his extensive injuries did not arise “out of” employment. As a result, Hampton was unable to collect workers comp. – When he requested time for a break to adjust his blood sugar, they immediately consented. – When Hampton complained about not feeling well toward the end of the shift, he was told to sit in the truck. He left the truck and walked toward the bridge rail on his own. The court noted that Hampton’s diabetes was not under control, which certainly raises the issue as to whether it was safe for him to perform this kind of work; if the employer had awareness of the medical condition, they should have required a note from Hampton’s doctor that it was safe for him to perform the essential job duties. The court implies that there were circumstances where an injury might have been compensable: for example, if Hampton had been working near the edge of the bridge and had experienced a black out due to hypoglycemia, he would likely have been eligible for comp benefits. However, if it could be proven that the black out was the result of his own negligence in attending to his illness, perhaps the claim would still have been denied. But Hampton was sitting in a truck, safe and secure, with no unusual risks or exposures. He was clearly out of harm’s way. There is no way of knowing why he did what he did, but it is clear that work had nothing to do with it. When he went over the rail of the Muhlenberg bridge, he gave no thought to the workers comp safety net that usually covers his every working moment. The findings of the court are both harsh and fair. For Geoffrey Hampton, the fateful date of 9/09/09 will resonate every moment of his diminished life. In December of 2010, OSHA introduced stronger worker safeguards to prevent falls in residential construction. Under the prior directive, some employers were able to bypass fall protection requirements. The new standards for residential construction were scheduled to go into effect on June 15, but earlier this month, OSHA announced a three-month phase in to allow employers time to gear up to meet compliance requirements. During the phase in, however, employers must be fully compliant with the old directive. OSHA estimates that 1.6 million Americans are employed in the construction industry, half of which work in residential construction. Each year, roughly 38,000 construction injuries are reported. Fatalities from falls are the number one cause of death in construction, with an average of 40 workers killed each year as a result of falls from residential roofs. These are preventable deaths. The end-use of the structure being built must be as a home, i.e., a dwelling. OSHA has provided a site that offers resources and training materials about the new directive: Residential Fall Protection. Additional materials can be found at OSHA’s OSHA’s Fall Protection – Construction page. Falling off stages isn’t all that unusual a work-related occurrence for musicians and other performers. Celebrity spills are a favorite fare on the Internet, with video clips drawing millions of viewers and little sympathy. Fashion model falls seem to be a particular favorite for the YouTubers, and frequently available given that a job-related hazard for models is teetering around on ridiculous footwear. But despite the vicarious pleasure that many viewers take in seeing pop culture icons coming down to earth, slips and falls are nothing to take lightly – they are one of the most common injuries in many professions, resulting in disabling injuries. They are also a leading source of fatalities in the construction industry. We went looking for more information about musician injuries and came upon Looking at Musicians’ Health Through the Ages, an examination of performance-related musculoskeletal disorders (PRMDs) from the scholarly Medical Problems of Performing Artists. This is a publication that bills itself as “…the first clinical medical journal devoted to the etiology, diagnosis, and treatment of medical and psychological disorders related to the performing arts. Original peer-reviewed research papers cover topics including neurologic disorders, musculoskeletal conditions, voice and hearing disorders, anxieties, stress, substance abuse, disorders of aging, and other health issues related to actors, dancers, singers, musicians, and other performers. Alas, the interesting articles entitled “Bagpiper’s Hernia” and “The Psychological Profile of a Rock Band: Using Intellectual and Personality Measures with Musicians” are available only to subscribers. For some other sites related to musician injuries, see Musician’s Health, an educational website devoted to common musician’s injuries and information on preventing those injuries. Instrumental injuries often include similar repetitive motion injuries to those that are commonly associated with computer use. Musicians’ Injuries describes various types of performance-related injuries and offers advice on how to avoid them. Hearing loss is another risk for musicians and conductors – and not just for rock musicians, as might be commonly assumed. Doug Owens, a USM music education professor and trumpet player who has experienced hearing loss himself, has been studying the issue of hearing loss and musicians. For his doctoral dissertation, he had ten high school band directors wear noise monitors for two days on the job. “Owens found they were exposed to mean average noise levels of 85 to 93 decibels, similar to a vacuum cleaner or a leaf blower. Noise exposures peaked at 101 to 115 decibels, similar to a jackhammer or a crowd at a basketball game. In learning more about this topic, we also discovered H.E.A.R., a site with an acronym that stands for Hearing Education and Awareness for Rockers. The site describes itself as “a non-profit grassroots hearing health organization of hearing professionals, audiologists, ear doctors, educators, music industry professionals, and musicians dedicated to the prevention of hearing loss and tinnitus for musicians, music students, recording engineers, music industry professionals and music fans, especially young people.” The site offers the latest in hearing-related research, news and advice, along with a quick and easy test to assess whether concerts are harming your hearing. Creative work safety contests are somewhat rare but they can be a great way to get kids and young people thinking about workplace safety early. We were happy to see that this year’s winners in the Safety@Work Creative Awards for digital animation and poster design were recently announced. Safety@Work Creative Awards is sponsored by the Workplace Safety and Health Council and Singapore Technologies Engineering Ltd in collaboration with Ministry of Manpower. The awards are designed to showcases local students’ creative talents in advocating the importance of safety at the workplace. The competition was open to all full-time students enrolled in tertiary institutes in Singapore, including ITEs, polytechnics, universities, as well as art academies, colleges and institutes. This year, there was a specific focus on fall prevention, which students could interpret as falls from heights or falling objects. Here are the winning safety posters for 2008. They are very clever, and available for downloading. And be sure to scroll down the page to see winners from past years. Health Wonk Review – David Williams has a snappy new edition of Health Wonk Review posted over at Health Business Blog. Because HWR took a little summer hiatus last week, this issue is packed – and it’s all organized in a great format that allows for quick and easy scanning. David’s witty summaries are fun – check it out, it’s a good edition. Crane fatalities – rawblogXport points us to the story of an eyewitness account from one of the workers who escaped in last week’s LyondellBasell’s crane collapse that killed 4 workers and injured 7. The article’s sidebar recounts the number of crane accidents so far this year. Celeste Monforton posts more on this and other crane fatalities at The Pump Handle. PBM shakeup – Joe Paduda has the skinny on PMSI’s recent sale to investment firm HIG. Find more detail in his post PMSI sale – the numbers. Disgruntled claimant on trial for murder – When you’ve worked in insurance for awhile, you know that a lot of anger and tension can surface around money matters, even more so when things reach a litigation stage. And many a claims manager can cite a litany of stories about angry calls or threats from disgruntled claimants who feel they’d had a raw deal. A story from California today reports on the trial of a claimant who shot and killed his own attorney two years ago. Angus McIntyre was very angry at his workers compensation settlement. He had reportedly threatened and harassed his claims adjuster in e-mails and voice mails on numerous occasions and apparently also held his attorney responsible. One evening he walked into that attorneys office and shot him in the head. Terrible story, and a sad reminder that violent threats must never be taken lightly. When cables broke on a scaffold on the 47th floor of a New York high-rise residential building on a crisp December day, it took only about 6 seconds for the two window washers who had been on the platform to plummet 500 feet to the ground. Edgar Moreno was killed instantly but, astonishingly, his brother Alcides Moreno survived the fall. The word “miracle” is often tossed about lightly, but in this case, Alcides Moreno’s survival was part miracle, part physics, and part good medicine. As Moreno fell, he clung to the scaffolding, riding it to the ground and the platform provided wind resistance that slowed his fall. While his brother Edgar struck the ground at a probable speed of about 100 miles per hour, experts say that Alcides’ descent probably slowed to about 45 miles per hour. Platform cables acting like the tail of a kite may have slowed him further. Of course, Moreno suffered grievous injuries – broken ribs, a broken arm, shattered legs and spine damage. He was in a coma for weeks and has undergone more than 16 operations. But within a few weeks, the prognosis looked good not only for his survivability, but likelihood that he would be able to walk again. In mid-January, he was dismissed from the hospital to a rehab facility. It is sadly ironic that Morena survived a 500 foot fall, but William Bracken was killed in a 19-foot fall in a scaffold collapse in Mooreville, PA about 10 days ago. And in the city of New York alone, there have been at least two more scaffolding deaths since Moreno’s fall. High winds were blamed for a scaffold collapse in Brooklyn that killed Jose Palacios in a 12-story fall last week. This followed on the heels of the death of Yuriy Vanchytskyy in a 42-story fall from the top of Trump SoHo, a condominium hotel under development. State records show that in the Moreno incident, the scaffolding had been cited for 10 violations in June, including four that were repeat violations. According to news reports, the brothers had complained about safety issues but were told the scaffolding was safe. Neither of the brothers were wearing safety harnesses when the accident occurred. Repeat citations are not an uncommon story. A New York Times investigation into the collapse that killed Vanchytskyy found that his employer, DeFama Concrete, had a history of safety violations, had been fined tens of thousands of dollars in penalties, and had another worker death on record – the 2004 death of an employee who perished after falling 60 feet from the platform of a crane. In that accident, OSHA found a failure to provide sufficient safety devices. These fines and citations are apparently little more than a slap on the wrist because offending contractors are still hired to work on some of the city’s most prestigious new construction projects. It’s a horrifying and daunting problem, but to their credit, city officials are taking action, and some improvements have occurred since 2006. A Suspended Scaffold Worker Safety Task Force was formed and several scaffolding-related laws were enacted to increase penalties. Many are also calling for an overhaul of the Department of Buildings, the regulatory body, which many fault for being slow and reactive. Of course, all the deaths that we’ve discussed have occurred since these laws were enacted. The city needs to continue focusing on this issue because Alcides Moreno’s story notwithstanding, the miracle plan does not make for good safety policy.